It’s that time of year again when WHITE by Vera Wang bridal gowns from the Spring 2015 collection are being shown at David’s Bridal. The new collection features stunning modern bridal gowns, sleek new bridesmaid and formalwear styles, and feminine shoes, hair pieces and sashes. A few highlights of the Spring 2015 collection include a gorgeous illusion neck ball gown with lace appliqué and draped tulle bodice, a classic strapless ball gown featuring horsehair borders and delicate lace appliqués as well as a tossed tulle ball gown featuring intricate hand-beaded detailing. This season, the collection also welcomed a few new on-trend silhouettes as well as a polka-dot print and new “Sunset” color bridesmaid dress options. With the Spring 2014 WHITE by Vera Wang collection, exclusively at David’s Bridal, Vera Wang continues to incorporate her artistry and sophisticated design aesthetic into elegant looks for any modern bride and her bridesmaids. 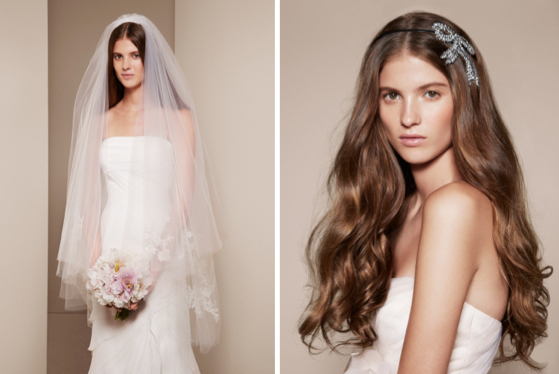 The Spring 2014 collection introduces new bridal gowns, bridesmaid dresses and accessories. The Spring 2014 Bridal Collection presents five new bridal gowns ranging from $728-$1,798 in a variety of feminine silhouettes with modern details.The bridal collection color palette includes White, Ivory, Champagne, Sterling and Blush while introducing new colors for the Spring season that include Blush/Gold and Champagne/Blush combinations. The Spring 2014 Collection introduces the limited edition Ebony Collection, priced between $728-$1,248, featuring five popular bridal gowns available in Ebony. The variety of styles includes SOPHIE, NATALIE, ELLA and EMILIA.The Ebony Collection will be available online for a limited time beginning in December at http://www.davidsbridal.com and at select David’s Bridal stores. The Spring 2014 Bridesmaid Collection, priced between $168 to $198, introduces four new dresses that reflect contemporary and classic styles in both short and long silhouettes. The Bridesmaid Collection introduces new colors into the collection including Mist (a light blue shade), Stone (a new neutral) as well as color combinations of Blush/Gold, Champagne/Gold and Cassis/Gold. The Spring 2014 Accessories Collection, ranging from $78 to $198, features elegant bridal accents that perfectly compliment any bridal look including headbands and veils. The Spring 2014 WHITE by Vera Wang collection is available now, exclusively at David’s Bridal nationwide, as well as online at http://www.whitebyverawang.com. With the most wonderful time of the year just around the corner everyone is beginning to search for that perfect gift for every lady on their list. Whether you’re shopping for your sophisticated mother, fashionable sister or trendy girlfriend – David’s Bridal has the goods this holiday season! Offering everything from show-stopping accessories and glitzy stocking stuffers to thoughtful hostess gifts and fashionable add-ons, you’re sure to leave all of your female giftees feeling the love this holiday season! Vera Wang will soon have her hands in another sector of the wedding market – the men’s market. Honestly I’m wondering what took her so long?! It was by announced by WWD, that Vera Wang has just about inked a deal especially for men’s tuxedo arena in a partnership with The Men’s Wearhouse. So now you can have your Vera and your groom can too! Ms. Wang created her bridal line in the late 1990’s, in 2000, created a ready-to-wear collection that by 2005 had her known as “Womenswear Designer of the Year.” In 2007, she created a contemporary women’s line for Kohl’s called Simply Vera and most recently, the White Label for David’s Bridal, which has the Vera feel, but at a fraction of the price. Of course you know she designed Kim Kardashian’s dresses and those dresses are now for sale at David’s Bridal. There is perfume, stationery, publishing, bedding, wedding rings and china. It seems that there is no wedding-stone left for her to turn over. Then again…there are still a few days left of 2011. You never know what else Vera Wang has up her sleeves. It should also be known that David’s Bridal and Men’s Wearhouse are apart of the same company so this seems to make perfect sense. Yes, they are absolutely keeping it all in the family. Brides this is a great opportunity. You can also take advantage of everything from wedding favors, the perfect wedding gift or prowl for bridesmaid dresses, because David’s Bridal is offering up big savings! Now through Monday, November 28th. Plus, Cyber Monday will offer even greater savings with an extra 40% – 50% off select items starting at 12:01am on Monday, November 28th. Cyber Monday discounts will be on items including various signature frames, personalized beverage napkins and sand ceremony sets. To check out all the holiday deals at David’s Bridal. I’ve been sitting on this from Vera Wang for over a week until bridal market began and I tell you, I was just about to burst. You all know that Vera Wang partnered with David’s Bridal and this (in my opinion) is so “Vera” but at an affordable price. This “White by Vera Wang Spring 2012 collection” will allow more brides to transform their wedding dreams into reality and make their day even more special. The tulle ball gown with Chantilly lace at the bodice, basque waist and cathedral train is as light as air. Think Kim Kardashian wedding dress…because that’s what it looks like! The one-shoulder basket-weave organza gown with a drop waist and organza petals looks so soft and you will simply float down the aisle. I’m one for color and love that there are two in the collection that are in pink or blush. Her bridesmaids for David’s Bridal are simply wearable. In colors like Amethyst, Blush, Charcoal, Ebony, Midnight, Moss, Orchid, Champagne and Willow will look beautiful both at the wedding and for any event after. There is also a selection of shoes, and hair accessories, so you can truly be Vera from the top of your head, to the soles of your feet. This collection will be carried in all 250 David’s Bridal stores in the US and their five Canadian locations. Bridesmaid gowns range from 0-26 and bridal sizes range from 0-14 but there are some select styles that are available up to a size 26. In a few days, I hope to share the Vera Couture Collection with you. When your name is on everything and I do mean everything wedding related, it could become a challenge to ‘add to’ your collection or change the perception of your product unless your name is Vera Wang. Several months ago, she announced her partnership with David’s Bridal to both applause and criticism. Would it keep its look and quality? Why would she ‘cheapen her brand?’ Most importantly “would brides go for it?” The answer is a resounding yes. So it’s no surprise that “White by Vera Wang for David’s Bridal, bridesmaid collection would continue with the same quality, exquisite detailing and yes even a few surprises. From the exposed zipper to raw-edged bias detailing to the richness in her color pallet, there is something for every bridesmaid. The 2012 collection provides an array of romantic, classic and whimsical fashion for the entire bridal party. Vera believes that each in her collection reflects the respect she has for women and how much each design means to her. So yes, you will see the signature folds and layers of organza, corded lace, silk and satin. Not to be outdone, her platform shoes add playful flare with the use of grosgrain bows. For the girl who doesn’t want height, Vera has created ballerina flats with crystal embellishments. The drum I’ve been beating the loudest and Thank You Vera for hearing it. Her dresses can fit a range of brides from 0-26. With prices from $158-$198 and shoes under $100, you’ll be beautiful and won’t break the bank.